Earn $80.00 in VIP credit (8000 points)What's This? 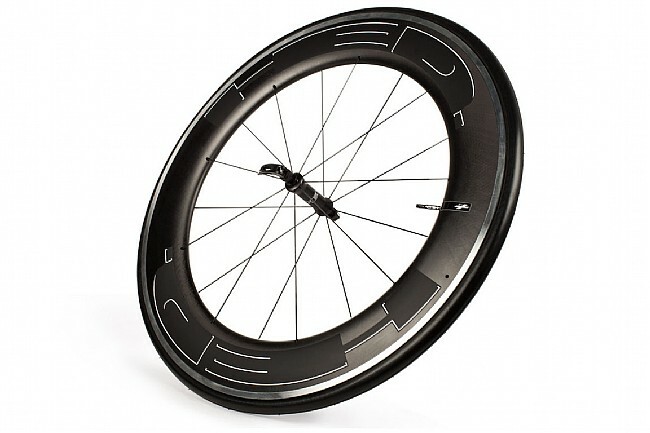 Now 25mm wide, HED's Jet 9 Plus FR Clincher Front Wheel is updated for even better performance. The Jet series is notable for its hybrid construction. A unidirectional carbon fiber shell is bonded to a traditionally spoked wheel, using HED's fantastic C2 rim, for an unparalleled combination of low weight, strength, and aerodynamics. With the wind cheating properties of a race day wheel and the sturdy construction of a training wheel, it's what they call a quiver killer. The Jet 9 Plus starts with HED's fantastic C2 aluminum rim, but unlike previous iterations, the Plus measures 25mm wide. This extra width results in a wider contact patch, greater sidewall support, and lower inflation pressures. The upshot of this is a faster rolling, grippier, more confident cornering, and more comfortably riding complete wheel. Using an aluminum rim also makes for a lightweight wheel that is still very durable and stiff, and allows for the use of traditional brake pads. Tubeless rim strips also make these suitable for use with or without inner tubes. At 90mm, the Jet 9's extreme depth is one of the most aerodynamic out there, much more so than shallower aluminum rims and many full carbon rims as well. The use of a carbon fiber shell also allows for specific shaping to make the most efficient shape possible. For the best possible performance, HED employs what it calls Stability Control Technology (SCT), which improves handling in crosswinds so this wheel is stable regardless of wind direction. Since it doesn't need to be structural, the carbon can also be made thinner and lighter to shave additional grams off the wheel. The Jet 9 uses HED's exclusive Sonic FR front hub featuring a carbon shell, alloy flanges, and cartridge bearings. A 12mm oversized axle and extra-wide flange spacing reduce flex and improve overall stiffness. 18 ultra-light Sapim CX Ray bladed spokes are laced radially to further lateral rigidity, weight reduction, and efficiency. The Jet 9 Plus FR Clincher Front Wheel has a claimed weight of 895 grams. Titanium skewer, tubeless rim tape, and valve extender included. Note: This wheel is sold individually. Because many riders prefer wheelsets with non-matching rim depths, a rear wheel must be purchased separately. If you would like to pair this wheel with a HED rear wheel that is not currently listed online, please contact us for specific availability.